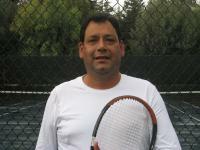 Francisco is an International Tennis Federation(ITF) High-Performance Coach. The ITF high-performance certificate is one of the highest possbile in tennis instruction worldwide and much sought after. Over the years Francisco has been able to pass on his accumulated knowledge of the game to nationally and internationally ranked players. He has also been the traveling coach for many ATP and WTA professionals. Touring with these high-ranked pros, he has picked up on advanced techniques and nuances of the big game. He continues to share these gems of tennis wisdom with local Bay Area tennis competitors. After coaching and start SVTA for over 21 years, Francisco helped establish a branch academy in San Carlos. Francisco is CPR and FirstAid Certified. In his spare time, he enjoys spending time with his family. Francisco makes it a point to attend the U.S. Open every year, where besides catching the action he no doubt catches up with his many professional acqaintances.